In Reversal, EPA Leaves Restrictions On The Table As It Considers Alaska Mine Permits In a surprise announcement, EPA Administrator Scott Pruitt said the agency will not rescind protections imposed in 2014, based on assessments the mine would cause significant harm to the watershed. The Environmental Protection Agency said in a surprise announcement Friday that it is putting on hold a plan to do away with Obama-era proposals to restrict mining at a southwest Alaska watershed. But the EPA also said it would continue to consider permit applications from those hoping to extract copper and other minerals from the proposed Pebble Mine. EPA Administrator Scott Pruitt said in a statement that Bristol Bay fisheries deserve protection and that the proposed Pebble Mine may pose an "unacceptable" risk. In the announcement, Pruitt said, "any mining projects in the region likely pose a risk to the abundant natural resources that exist there." Pruitt said the agency would gather more information on the project's impact on fish and natural resources. "Until we know the full extent of that risk, those natural resources and world-class fisheries deserve the utmost protection," he added. Last year, the EPA began reconsidering restrictions that were first proposed in 2014, based on its Bristol Bay watershed assessment. The report determined that mining on the scale of the proposed Pebble Mine would have "unacceptable adverse effects" on the watershed. Pebble Limited Partnership, a subsidiary of the Canadian mining company Northern Dynasty Minerals, announced a new investor and submitted its first permit application to build the mine last month. The EPA says it received more than 1 million comments from stakeholders — more than the number of people who live in Alaska — the majority of which were against withdrawing the earlier proposed protections. Alannah Hurley with United Tribes of Bristol Bay, a group opposing the mine, has said members of the tribes she represents are willing to lie down in front of bulldozers to protect the waters. She called the EPA's move huge. "These proposed protections, the fact that the Trump administration is choosing to keep them on the shelf, is a recognition ... that the Pebble Mine is too toxic, even for the Trump administration," she said. Hurley spoke by phone from the commercial fishing hub of Dillingham, the seat of resistance to Pebble Mine, where she said activists were jubilant about the EPA's announcement. "The people of Bristol Bay are really celebrating the fact that the protections that we have fought so long and hard for are not being withdrawn by the EPA and instead could potentially later be finalized," Hurley said. 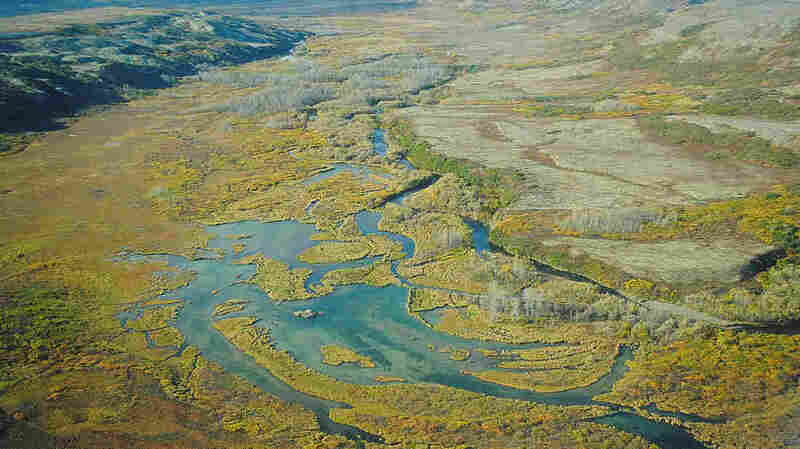 Bristol Bay's fishery is the source of almost half of the world's wild sockeye salmon, according to the EPA. In addition, the region's indigenous communities rely on salmon for sustenance. Commercial fishing provided more than 14,000 full-time and part-time jobs in the region in 2009, the agency says. The Bristol Bay Regional Seafood Development Association, which opposes the mine, says the fishery produces $1.5 billion in economic activity each year. PLP CEO Tom Collier said in a statement that the EPA's announcement "does not change our approach," and said he believes Pebble "can responsibly construct and operate a mine ... that meets Alaska's high environmental standards." According to the EPA, its announcement "neither deters nor derails the application process of Pebble Limited Partnership's proposed project." Alaska Gov. Bill Walker thanked the EPA and said in a statement that he had talked with Pruitt and "shared with him my belief that in the Bristol Bay region we should prioritize the resource that has sustained generations and must continue to do so in perpetuity." Alannah Hurley of UTBB said the suspension casts a cloud of uncertainty on the permitting process for the mine. "Ideally we would like these [protections] finalized, and the battle to protect Bristol Bay from the Pebble Mine and mines like Pebble is far from over," she said. "But the fact that these protections remain in place and can be used within the process is a very positive step in the effort to protect the Bristol Bay watershed for generations to come." Editor's note on Jan. 29: The headline and top of this story have been edited for clarity.